Lazy weekend in Perth | 15,000kms of Food! Whilst traveling to Perth is by airplane, and therefore does not add to my quest for more kilometers, I thought I’d do a quick blog about this as we had such a delightful time there. We stayed at the Sheraton, which lived up to the normal Starwood standards. The room was spacious and well furnished, with the highlight of the room being the bed! Those heavenly beds rock my world! Pillowy softness made for a fantastic nights sleep. The other highlight of the hotel was the hash browns that were served for breakfast. We stayed for 3 nights and every morning, there they were. Golden crispy outside, soft potato goodness on the inside. Delicious! Our dining experience in Perth is well worth mentioning. The 7 course degustation at Star Anise with matching wine was delicious and was a good “progression”. The winning dish for me was the “marron, hiramasa kingfish, ‘tom yum’” – delicate seafood sitting with a tom yum reduced jelly. Winning dish for my partner was the “lightly smoked ocean trout, crackling, seaweed, enoki, edamame, winter melon, brown rice tea broth” – good tasty broth again with delicate seafood. Well worth the trip out the Shenton Park (which is about 10 mins out of the city by cab). Whilst roaming around Perth city, starved for a good coffee, we stumbled upon a strange looking extension to an office building in the heart of the city. The extension had walls made of potted plants, with doors that had handles of spades and tables and chairs made from what looks like recycled crates. Lo and behold, it was Greenhouse. This was around the time that Matt Stone was awarded the Gourmet Traveller best new chef award so it was totally hyped up for me. And it lived up to it! 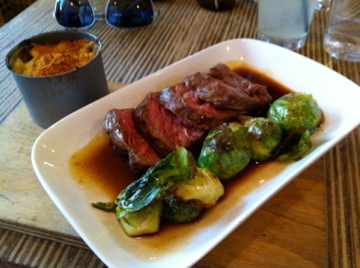 I enjoyed a delicious blade steak with caramelized brussel sprouts and a cauliflower tartin. It was spectacular. Had a fantastic weekend away, can’t wait to return to try more restaurants and return to Greenhouse! sounds worthy of a flight…when the weather cools over there!